What should have been a routine traffic stop for Monroe County, Indiana, cops turned into an all-out manhunt for the driver, who thought he was above the law. According to Nixle.com, Trooper Adam Davis was driving northbound on State Road 37 near Acuff Road just north of Bloomington, when a northbound silver Ford Focus passed his fully marked police vehicle at 100 mph in a 55 mph zone. When Trooper Davis got the vehicle stopped near Bottom Road, upon his approach to the driver’s side window, the driver indicated he was exempt from being stopped by Law Enforcement and proceeded northbound on State Road 37. Again, Trooper Davis pursued the Ford Focus as it continued northbound, following it westbound on Simpson Chapel Road and then ultimately westbound on Williams Road. The driver then abandoned the vehicle and fled. ISP Troopers saturated the area and immediately notified residents living in the neighborhood of the description of the male driver as given by Trooper Davis and to call 911 if located. 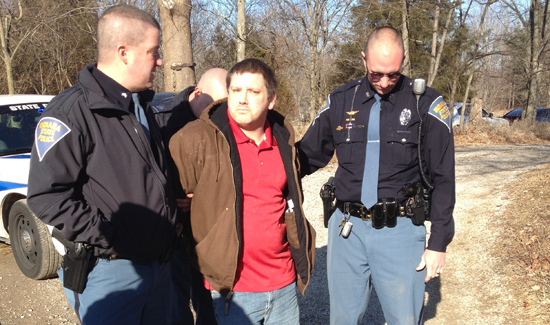 Within minutes, an area resident spotted the suspect driver hiding behind a house in the 800 Block of Williams Road and notified the ISP Bloomington Post Regional Dispatch of the information. Troopers secured the property and were able to take the suspect driver into custody after he initially resisted arrest.